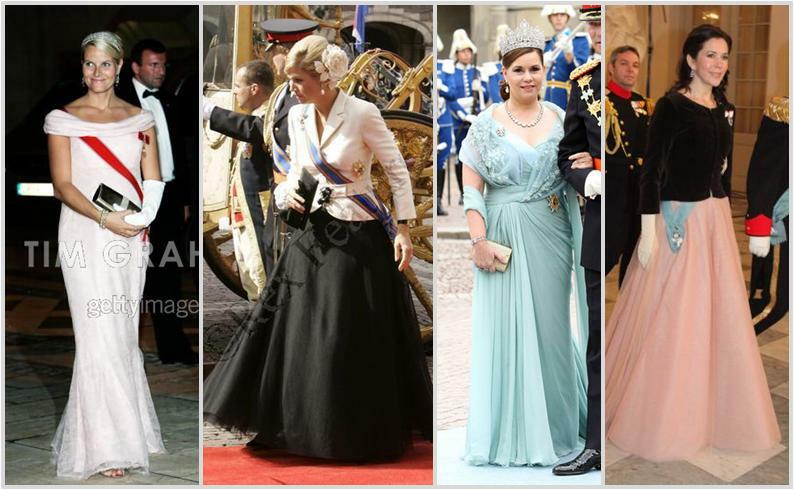 After valiantly attempting earlier this week to understand the reasons why royals so often just don't care about the matching their gown to their sash, I thought we should throw some praise at those appearances where things actually did work on that shallow, aesthetically pleasing level you know I operate on. And perhaps, along the way, figure out just what the formula is for a successful gala appearance. The most obvious tactic for a well-coordinated gala appearance is just to go the simple route and get a gown in about the same color as your sash. This is a lot like Queen Elizabeth's white gown strategy, only fussier, and in living color. Lucky you if you're one of those Scandinavian princess with a universally flattering pale blue riband to sport; unlucky you if you've got a bolder color - orange or something - to work with. Well, you can't match your gown and your sash precisely all the time. It would be impractical, for one, and totally boring for another. Enter coordinating colors. Stay in the same color family, like Letizia or Mary. (Can we have a moment of silence for the amazingness of that gown on Letizia?......Okay, moving on.) 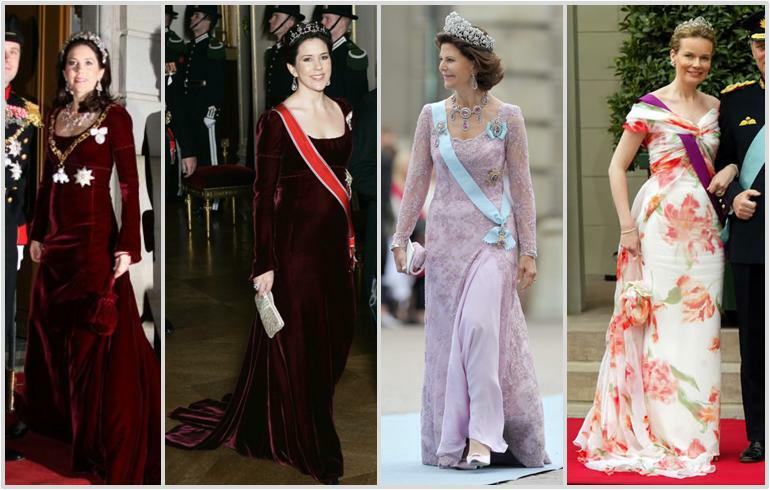 The magic of Victoria's famous magenta gown is the slight blue sheen, which picks that sash right up. Máxima's white gown in not just incredibly chic, it's also very cleverly matched to that particular sash (the Order of Leopold, from Belgium). Wouldn't have been nearly as good with a busier one, or something in a brighter color. Now, her orange Valentino gown shows off the complementary color scheme at work: blue and orange go together, and not just in football. And that's very much the same case as Maria Teresa's simple purple dress paired with her orange sash - one of the hardest to deal with, if you ask me. Here's another sneaky trick that'll get me to like your sash + gown concoction almost every time: incorporate the sash right in. Stick it under the fabric at the neckline, under a belt, within your wrap, or under your top. The colors don't even have to make perfect sense (Mary, hello), but it somehow looks perfectly planned. Mary's medieval red dress (which I've already confessed my love for and will continue to do so) was the perfect foil for the collar of the Order of the Elephant (and for once, a specific match for her ruby tiara), and she made a pretty good match the second time around while in Norway with the Order of St. Olav's red riband. Queen Silvia looked divine at Victoria's wedding in a perfect example of how to wear an intricate dress that is both color-matched to your jewels (all that gorgeous pink topaz) but includes enough of a tip to your sash to make it work. And my absolute favorite might just be Mathilde in her printed gown (not usually something that works when there's an order involved as it just gets cluttered) which is a good color match and includes an incorporated sash. Well played indeed. Are there any standout sash appearances that you've always loved?